Use the Tournaments screen shown below to create and manage tournaments. The important fields are described below. It links to the Add/Edit Tournament screen. Add New Tournament. Use this button to create a new tournament via the Add Tournament screen. Search Tournaments. Use this search field and button to search tournaments for a text string. In the screen shot above, the tournaments DB was searched for the string ‘2’. All the titles contain the character ‘2’. Title Header. 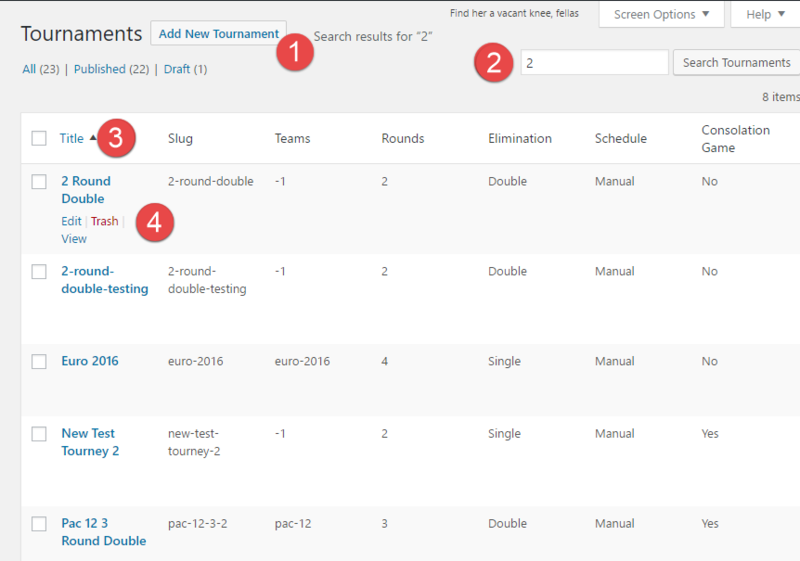 The list of tournaments can be sorted by the Title field. Click the arrow once to sort ascending, and again to sort decending. Title Field. Rolling over the Title field will display a list of actions on the Tournament, including Edit and Trash. Note on deleting a tournament: When you delete a tournament, it is moved to the Trash, but NOT deleted from the database. AND, any games associated with it also remain the database. The good news is that the tournament can be recovered from the trash. The bad new is that after moving a tournament to the trash, you should go into the Trash and delete the tournament permanently. This will also delete any games associated with it. Not doing so as the potential to create a mess, especially if you create a new tournament with the same name. Caveat emptor.